Garnier Olia shade 4.15, "Dark Soft Mahogany," adds cool, somewhat red tones to your dark brown results for the most brilliant mahogany color with 100% gray coverage. It is best for anyone with natural hair between light brown and black. If you would like to remain in the dark brown range but would like to try other tones, there are many shades to choose from including 4.0, 4.03, 4.3, 4.35, 4.60, and 4.62. *For women with currently color treated hair, there are special considerations for the color result you can achieve. Because of this, we do not recommend shade 4.15 for hair that has been previously colored shade 3.0, "Darkest Brown," or darker. For more help, use our Shade Selector Tool to find the perfect shade for you! Rated 4 out of 5 by paytonb3 from Love this hair color! It always gives me the best results and the color seems to last longer than other brands! Rated 5 out of 5 by kayla_n_jackson from This is my absolute favorite box dye brand to use and my hands down favorite shade its , a deep brown with undertones of red when it hits the light , its not potent , no ammonia , no eye burning or scalp burning , my hair looks revamped and it looks healthier !Garnier Olia Oil Powered Permanent Hair Color Here is my before and after photos ! Rated 5 out of 5 by Rox 201 from Switched from Nutrisse to Olia! I have been a Garnier hair person for years. Have 2 reviews that were posted about my experiences with Nutrisse, which I loved until I tried Olia. I have been coloring with Olia for about 2 years now with zero issues since they redesigned that annoying round applicator bottle. Here’s some tips about coloring. The hair color result is dependent on your starting hair color and it’s undertones. Very dark hair will not lighten with a lighter color. I used to color my dark brown hair a soft black but as I aged, I wanted to go back to brown so I did that by coloring my new growth only with darkest brown. It took about a year for the black to grow out. I was then able to lighten the shade of brown using the same method. Do not color your whole head every time you color. The color will layer upon itself and darken. Color only your new growth. Do a whole head every 5th or 6th time if your hair is longer. 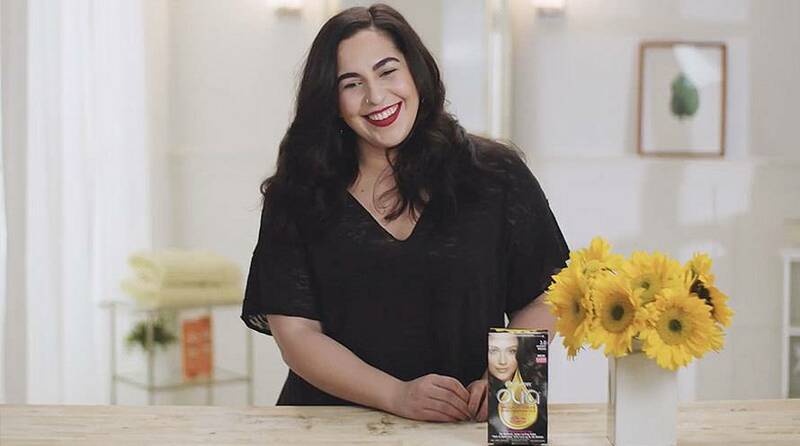 It will refresh the ends which tend to fade faster.I started using Olia Dark Brown but when this Dark Soft Mahogany came out, I tried it and never went back. I have resistant grays so I leave the color in for 60 min. Olia never stains my skin because I wipe the excess off with a cotton pad and astringent. I color my brows with it also. Hair is soft and the color Is rich looking. I do use Garnier leave in conditioner which helps. Rated 1 out of 5 by leilanib1 from I am thoroughly confused. The box was purple, the dye was purple, it went in my hair purple, my conditioning cap was purple, it washed out purple, YET MY HAIR IS RED AND MY EDGES ARE ORANGE! I was told there was no ammonia and no peroxide yet my hair is lighter. I am confused and I DO NOT recommend. But in a good note it smelled amazing and my hair was very soft after. Rated 1 out of 5 by jessical0970 from Absolutely zero color stuck to my hair. 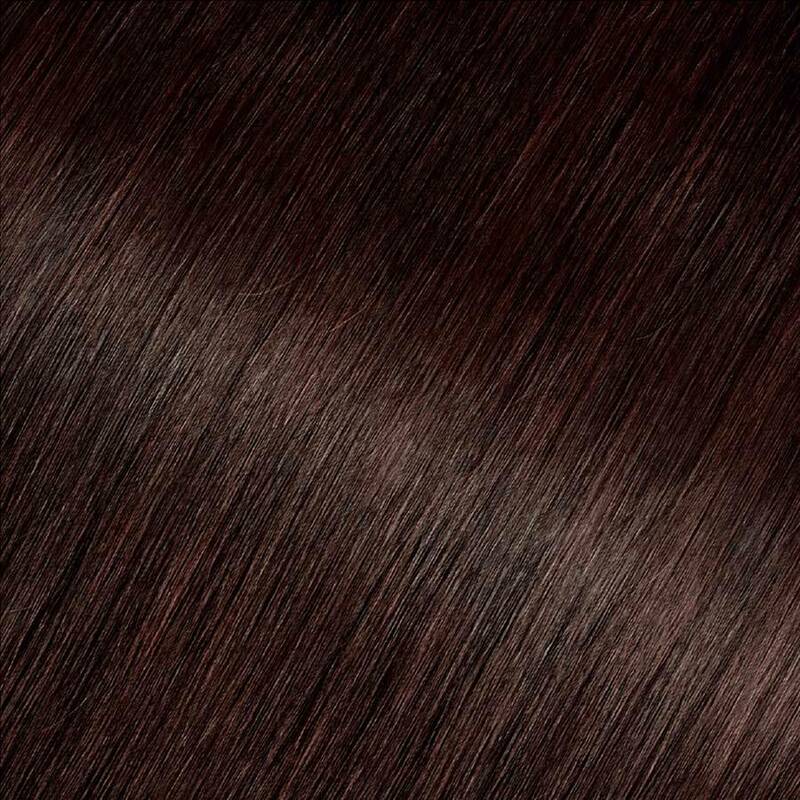 I'm a natural dark brunette and it recommends this color for light to dark brown. After 30 minutes of processing and a pretty good job of ombreing this product with a hair color brush, I thought it was going to be great. All the color washed right down the drain and left my hair exactly as it was before I colored. Not even a slight tint. Very disappointed. Stick with ammonia hair color if you have dark hair.sont waste your time or money on this. 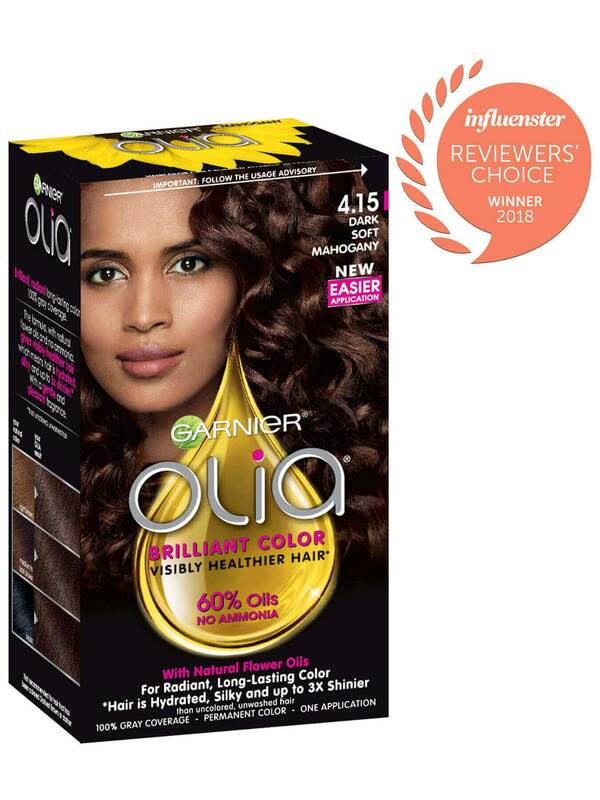 Rated 5 out of 5 by oliviagraham331 from Garnier Olia Oil Powered Permanent Hair Color was an amazing color for my hair. I received this complimentary from Influenster in return for my honest review. I didnt know if I'd like the color on me but it was definitely a nice change on me! Wasnt harsh on my hair at all and didnt smell horrible! Rated 5 out of 5 by kericb6df from I received this product complimentary of Influenster, I love the color, also my hair is soft and shiny. Sometimes when I have dyed it before it looks dry, but looks and feels great!